Infestations, water leakage and defected insulation often go unnoticed, sometimes for years, until the damage and destruction wrecks havoc and becomes visible beyond the confined space of the attic or crawl space. Protecting your home from potential hazards is the key to a safe, tidy and functional property. Therefore, a routine inspection is recommended on a yearly basis.We, at Quartz Solutions, are a team of skilled professionals, equipped with the latest technologies in the business. 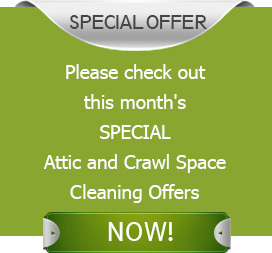 Call us today to schedule a free inspection of your attic and crawl space. Our experts help you with a reliable and effective plan to get rid of the menace. Dripping ducts make way for moisture and water, which causes the temperature to fluctuate. This can lead to increase in utility bills. Insects like wasps, roaches, fleas and spiders pose a health threat to humans. Animals like rats, bats and mice may appear innocuous. But they nibble on cable wires, upholstery and furnishings and leave a filthy mess. Excessive moisture promotes the growth of mold, fungus and mildew. These can ruin woodwork, and make the interiors suffocating, and more susceptible to breathing disorders and allergies. Leaking gases in the crawlspace slowly sneak into the living areas,polluting the entire property. 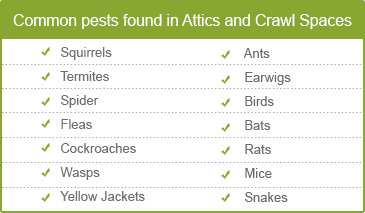 Inspection and assessment of the attic and crawl space is imperative for the well being of the premises. Testing the area for leaking gases, checking the broken ducts and cracked pipes, and tracking the pest and termite activity; a close evaluation will help provide valuable insight into the actual situation and the impending troubles. Once the analysis is complete, a customized plan to handle the issues is put forth. We know that money doesn’t grow on trees,therefore, our specialized and customized attic and crawl space services are cost-effective and extremely transparent. Cresskill is a small borough in Bergen County, New Jersey. The borough has an interesting history that dates back from the nation’s colonial period to the present date. We too want to help this small community to keep up with its history.Hire us to help you keep your attic and crawl spaces in top notch conditions. Hurry! Call Quartz Solutions at 201-205-2042and grab a complimentary inspection and evaluation of your attic and crawl space.